International, trendsetting research institutions such as the Ellen MacArthur Foundation in their report ‘The New Plastics Economy’ also envision an important role reserved for composting and fermentation of plastics. A wide range of businesses have participated in this report, such as Nestlé, IKEA, McKinsey, and DSM. Bioplastics, also known as biobased plastics, are plastics made out of natural materials. Recent research by CE Delft for the Ministry of Infrastructure and the Environment indicates that these biobased plastics play an important role in achieving CO2 reduction and switching from a primarily fossil and linear economy to one that is more circular and biobased and makes less use of fossil fuels. This is also confirmed in the report of the Ellen MacArthur Foundation mentioned above. The CE report also indicates that biologically degradable plastics can play a clear role in getting more biodegradable kitchen trash into organic-waste bins and reducing the presence of microplastics in the environment. Final compost still includes many plastic fossil fragments that are scattered over the soil together with the compost and often end up in the surface water. This leakage into the environment can be stopped by using compostable plastics. Undesirable leakage is caused by teabags, partially made out of polypropylene, which ends up in final compost and does not degrade in the environment. Other examples are agricultural film or plastic plant clips, both widely used in horticulture. Erwin Vink, chairman of Holland Bioplastics, is glad that an independent research institute has arrived at these positive insights which the government will now use as policy guidelines. Compostable bioplastics can also play an important role in collecting more organic waste. This is the case with compostable plastic bags or bags to gather organic kitchen waste, such as compostable teabags, coffee pods, and packagings for potatoes, vegetables, and fruit. It would also be beneficial to make fruit labels compostable. It looks like collection of organic waste will be obligatory within the EU in the future. At the European level and in leading countries such as Italy and France, legislation has already been introduced to require switching some of these applications into biobased and compostable bioplastics! In that respect, Holland Bioplastics would welcome a more proactive and leading role from the Dutch government. CE Delft also concluded that compostable plastics may be a solution for packagings that are difficult to recycle and are made out of traditional plastics, such as multi-layered structures. This is confirmed by the WUR. 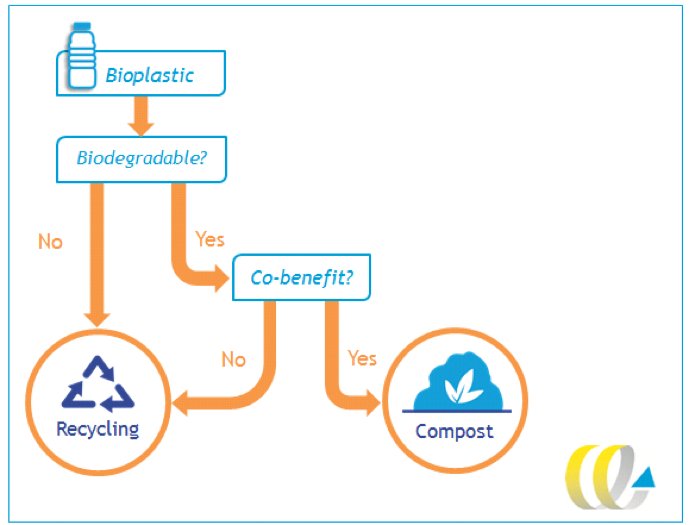 In the figure presented above CE Delft specifies what should be done with biodegradable plastics. Biodegradable plastics certainly do not belong with residual waste – they contribute to the production of more and better-quality compost. Holland Bioplastics is also pleased with the clarity that the CE Delft and WUR reports establish in terms of how to deal with bioplastics waste. The Netherlands Institute for Sustainable Packaging (KIDV) has brought out a series of standardised logos with easy instructions for consumers about where packaging waste should go. According to Erwin Vink,this makes it very simple for every consumer.“Compostable bioplastics that benefit the environment by being collected as food or garden waste display logos in the packaging that clearly identify them and indicate that the packaging should be disposed of as organic waste.” If there is no logo, then the plastic goes into a dedicated plastics container (known as a ‘Plastic Hero’ in the Netherlands). “We all know how important it is to reduce CO2 emissions and our environmental pressure, and with these new guidelines we provide a great deal of clarity for consumers as well,”adds Vink. In that respect an important task has been reserved for bioplastics producers and processors. To maximise the positive effects of bioplastics, consumers must be made aware of what the seedling logo stands for, and why products and packagings displaying it must be disposed of in organic-waste containers.